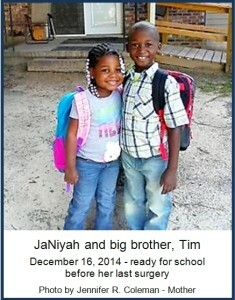 At two years of age, JaNiyah’s mother noticed that JaNiyah had weakness on her right side. MRI diagnosis showed an epidermoid in the location of the skull base. Her first surgery for debulking treatment (removing some of the contents of the tumor, not removing the tumor) was June, 2011. The epidermoid sac soon filled back up again resulting in second debulking surgery in January, 2012. She went a whole year without being in the hospital after this. But because of surgery scar tissue, excess cerebrospinal fluid (CSF) had collected and JaNiyah had to be shunted to remove fluid and improve circulation of CSF. The ventriculoperitoneal (VP) shunt failed, and the doctors’ only intervention was a third debulking surgery in August, 2013. She was placed back in hospital for check in May, 2014, to see if the CSF would circulate correctly with a tube directly placed into tumor to drain the tumor. The thickness of the CSF and contents of the tumor closed the tube. Her neurosurgeon decided against debulking for the 4th time because lack of previous success. JaNiyah’s mother was told that the surgeon would have to go in manually to remove contents. JaNiyah had a traditional craniotomy surgery in December, 2014. JaNiyah’s fourth surgery unfortunately has left her in a wheelchair. Hopefully by next year, she will make progress and make her wish come through to be a cheerleader for peewee basketball. She likes to sing and dance so she would be a natural cheerleader. When asked about JaNiyah’s favorite things to do, her mother says she likes hanging out with her. Also playing outside with her big brother and looking at movies. And she loves her little cousins and loves being their babysitter when they are around. All in all, Jennifer Coleman says her “best friend” is full of joy all the time. JaNiyah received a gait walker trainer recently to help her to walk again. She is thrilled; her mother says and JaNiyah is hanging in there from her last surgery with a great positive attitude. And her mother speaks of her as “OK” and a regular six year old girl looking forward to school this fall. The last four years of life, JaNiyah has been subjected to many treatments as the neurosurgeon and staff at UF Health Shands Hospital, Gainesville, Florida, try to treat her epidermoid brain tumor. They can’t seem to make it go away or stop growth.